The Global Center on Cooperative Security and the UN Counter-Terrorism Committee Executive Directorate (CTED), in close partnership with the Inter-Governmental Action Group Against Money Laundering in West Africa, hosted a three-day workshop in Dakar, Senegal on the effective monitoring of alternative remittances to prevent terrorist financing abuse in West Africa. This workshop, supported by the Netherlands Ministry of Foreign Affairs and the German Federal Foreign Office, brought together representatives from central banks, financial intelligence units, and law enforcement agencies from twelve countries, as well as non-governmental organizations, selected private sector companies, and key regional and multilateral organizations. National government representatives hailed from Burkina Faso, Chad, Ghana, Mali, Mauritania, Niger, Nigeria, and Senegal. International experts from Afghanistan, Namibia and the Philippines, as well as resource persons from Europol, UNODC, and UNOWA, were also in attendance. The objective of this meeting was to identify potential areas in which alternative remittance systems (ARS) are vulnerable for terrorist financing abuse and to discuss best practices to strengthen existing regulatory frameworks while promoting financial inclusion. Presentations examined regional channels and corridors, micro and macro impacts of remittances, key threats and vulnerabilities of the ARS sector to terrorist financing abuse, and opportunities to strengthen existing legal frameworks. This workshop is part of a larger joint capacity building project, launched by CTED in collaboration with the Global Center, to enhance the ability of countries to prevent the abuse of ARS for terrorist financing purposes. 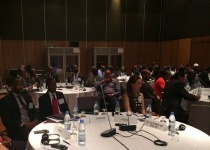 The inaugural workshop was held in December 2013, tailored to the subregion of East Africa and the Greater Horn. These roundtables aim to serve as a “conversation starter” in regions where regulatory frameworks are limited, and to facilitate continued discourse among regional governmental agencies and the private sector on ways to effectively monitor remittance flows to prevent terrorist financing abuse in a manner that is proportionate to the risks.